Shortly after Tai found his Crest, the Crest of Courage, the DigiDestined kids were trapped in a stadium by Etemon, and Tai's Greymon was forced to battle another Greymon under Etemon's control. Greymon had difficulty fighting, as he was stuffed full of food, as a result of Tai overfeeding Agumon previously, to try and help his Digivolving to the next level with the Crest. Greymon was losing the fight, and no matter how hard Tai tried to make it happen, his Crest would not make Greymon Digivolve to the next level. Tai decided to throw himself in front of the other Greymon, thinking that would force the Digivolution process, but instead, as Tai's foolishness superseded his courageousness, the process became corrupted, and Greymon Digivolved into SkullGreymon. SkullGreymon defeated the other Greymon, and Etemon made himself scare, while the skeletal Digimon turned on the other kids and their Digimon. The Champion Digimon battled him, and he smashed through the coliseum walls, stumbling out into the desert, where his energy expired, and he reverted back into Koromon. Thanks to Piximon, Tai and Agumon then managed to conquer the fears about Digivolving this incident had put in their minds, Tai learned how to use his Crest, and Greymon was able to Digivolve into MetalGreymon. Four years later, Greymon fell under the control of one of the Digimon Emperors Dark Rings. The Emperor planned to use him as a weapon against the new DigiDestined, and had his Airdramon airlift Greymon to where the kids were battling some Meramon. The Emperor attempted to make Greymon Digivolved to MetalGreymon, but the evolution was unnatural and forced, and as a result, Greymon became SkullGreymon once more. SkullGreymon dispatched the Meramon, and then defeated all of the Armour Digimon, causing them to De-Digivolve, and was then attacked by a hoard of DarkTyrannomon, also under the Emperors control. He bested them just as easily, and then destroyed the Control Spire in the area, and reverted back into Agumon. The Emperor quickly captured him again, and took him back to his base, where he continued to experiment, trying to make him Digivolve to MetalGreymon. The experiments kept failing, and we saw Greymon become SkullGreymon twice more, until the Emperors partner, Wormmon, freed Agumon, in the hopes that the Emperor would use him for his plans instead. It was a vain hope, as the Emperor pursued Agumon, and then attached his newest creation, the Dark Spiral, to him, which gave him a power boost, enabling him to Dark Digivolve into a viral version of MetalGreymon. SkullGreymon appears in "The Arrival of SkullGreymon." His voice is supplied by Doug Erholtz. Name: From the word "skull," and the word "great," which "grea" is short for, and which "grey" is probably a misspelling of. SkullMeramon is a minion of Myotismon, who searched Odaiba for the Eighth Child, the predestined eighth member of the DigiDestined. Disguising himself with a trench coat, SkullMeramon used his copy of the Crest of Light to search for the Eighth Child - Joe and Izzy almost ran straight into him when they were looking for the others outside the subway station. When the kids mobilised a day or so later, Sora and Mimi set off to search for the Eighth Child together. Unsurprisingly, Mimi began to whine about how tired and hot she was, and they two of them stopped to rest inside a local tourist-attraction tower, only to be attacked by SkullMeramon while there. Togemon and Birdramon couldn't handle him, but MetalGreymon arrived to take him out with his Giga Blaster attack. SkullMeramon, for all intents and purposes, first appears in "Almost Home Free," where he is seen stalking the streets in his trench coat, and has his near run-in with Joe and Izzy. Prior to that, however, in "The Gateway To Home" and "It's All In The Cards," he was shown in silhouetted form. He was not referred to by name, and did not get a Digimon Analyser screen, until "Gatomon Comes Calling." Name: From the word "skull," and the Japanese word "meramera," meaning to burn. SkullSatamon is a member of the Daemon Corps, who attacked Tokyo just after Christmas, in search of Ken Ichijouji and the Dark Spore within him. 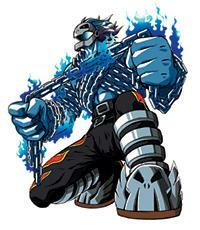 His powerful Nail Bone attack can paralyse his opponents, and his blinding speed gives him a strong edge in battle. Upon arriving in the real world, the Daemon Corps lay low  SkullSatamon and LadyDevimon sought out Ken during the night, and found his familys apartment. The reported back to Daemon that they had located him, and the next day, revealed themselves to the populous. As MarineDevimon menaced a cruise ship, and LadyDevimon tussled with Angewomon and Aquilamon, SkullSatamon took on MetalGreymon, MegaKabuterimon and Paildramon, quickly and easily knocking them all down. In retaliation, Paildramon Mega-Digivolved to Imperialdramon, but was immediately paralysed by SkullSatamons Nail Bone attack, which froze his data. The other DigiDestined and their Digimon arrived, but SkullSatamon had no difficultly in dispatching them, reverting some of them to their Rookie stages. His job was made easier when the remaining original Digimon reverted to Rookie spontaneously, as a result of spending so much time in the real world. SkullSatamon then turned his attention to a nearby bus full of children, which he hoisted into the air. The Digimon all then gave up the power gifted to them by Azulongmon, using it to energise Imperialdramon, who overcame the paralysis, and Mode Changed to his Fighter Mode. SkullSatamon merely laughed  but Imperialdramon wasted no time, blasting the villain with his Positron Laser, deleting him outright. 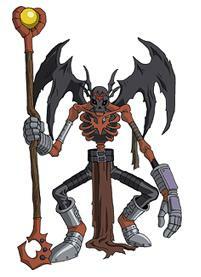 SkullSatamon appears in Invasion of the Daemon Corps. His voice is supplied by Dave Chewie Guerrie. Name: From skull, and Satan, the Devil in Christian belief. Many were surprised to see that this name was kept for the US, as religious references are normally avoided  there was initially some complaint about the pronunciation  it was Skull-SAH-tah-mon, but people thought it should be Skull-SAY-tah-mon, to match the pronunciation of Satan. However, the pronunciation used came straight from the Japanese version of the show. Snimon is one of Myotismon's minions, used as muscle, alongside Tuskmon. When Myotismon's minions were combing the streets, capturing the populous of Odaiba, Phantomon led Snimon and Tuskmon in an attack on Sora and Matt of the DigiDestined, who were guarding Kari, Tai's little sister, who had been discovered to be the Eighth Child, the predestined eighth member of the DigiDestined. Neither Matt, nor Sora, nor either of their Digimon was a match for Snimon and Tuskmon, but then, Kari offered to give herself up if the fighting stopped. Phantomon agreed, and took her away. Snimon popped up with Tuskmon again a short time later, when they were guarding the Odaiba TV station, where Myotismon had brought Kari. The kids' Ultimate Digimon battled and defeated them, and then went on to battle and destroy Myotismon. When Myotismon began to reconstruct himself as VenomMyotismon, Simons body was among those that his bats converted to energy to power his new form. Four years later, a Snimon under the control of one of the Digimon Emperors Dark Rings was seen attacking Tentomon, Biyomon and Patamon. It appeared again the following day, along with a Mojyamon and a Drimogemon, and battled the new DigiDestineds Digimon. Snimon went up against Halsemon, who destroyed the Dark Ring controlling him with his Tempest Wing attack. Some time later, Ken and Stingmon were seen battling a Snimon that had been created from a Control Spire by Arukenimon. Stingmon destroyed it, but Arukenimon later used several more Snimon in her attack on the DigiDestined in the Giga House. The Snimon  as well as the various other insect Digimon there  were under the control of her flute, and attacked Kari, T.K. and Yolei. Shurimon, Pegasusmon and Nefertimon managed to hold them off while the trio used the houses computer to undo the effects of Arukenimons flute. Sonya, one of the Russian DigiDestined, had a Snimon for a partner, which came to Earth along with many other Digimon when Arukenimon opened all the Digi-Ports. Sonya and her Snimon, along with Anna, Yuri and their Digimon, helped Sora and Yolei defeat swarms of Flymon over Moscow. This Snimon reappeared a short time later during the final battle with MaloMyotismon. A Snimon first appears in "City Under Siege." Sonya is one of the Russian DigiDestined, partnered with a Snimon. She, along with Anna and Yuri, met Yolei and Sora in Moscow, but because Ilya, Gennais Russian counterpart, was late in showing up to translate, they were all unable to communicate with each other. Eventually, Yolei hit upon the idea of using the two Russian words Sora knew  Peruski and Borscht  to organise an aerial attack on the swarms of Flymon above the city. The Flymon were defeated and sent back to the DigiWorld, and then Sonya and the others offered to take Yolei and Sora to lunch. However, Ilya then showed up, and took Yolei and Sora to Siberia. Sonya appeared again when MaloMyotismon was attempting to infect both Earth and the DigiWorld with pure darkness. 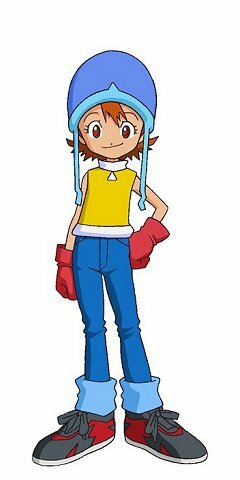 Sora Takenouchi is the mother-figure of the DigiDestined, partnered with Biyomon and holder of the Crest of Love. As a child, she and her parents lived in Highton View Terrace, and she attended the same school as her best friend, Tai. Sora bore witness to the battle between the Greymon and Parrotmon, and, at some point over the next four years, the family moved out of Highton VIew Terrace and into an apartment in Odaiba. Sora became somewhat tomboyish, and her relationship with her mother  which was already strained due to her father, a professor of mythology, not being home much  worsened as she wanted Sora to stop playing soccer and work with her at her flower shop. Any romantic feelings Sora may have appear to be torn between Tai and Matt. From the get-go in the DigiWorld, Sora has always kept an eye on Tai, mainly because she sometimes doubts that despite being the self-proclaimed leader of the group, he's not capable of dealing with certain situations. At first, Sora tried to prevent her Digimon, Biyomon, from getting too close to her, because she was afraid their relationship could turn out like her's with her mother. When Sora came under threat from Meramon, who was under the thrall of a Black Gear, Biyomon Digivolved to her Champion stage of Birdramon. After Devimon split the kids up, Sora came across Joe, who had almost drowned after a run-in with Ogremon. In an attempt to boost Joe's self-confidence, Sora and the Digimon let him be the leader of their small group - but unfortunately, he led them straight into trouble, in form of a gang of hungry Bakemon! Sora and Joe were nearly made meals of by the ghostly Digimon, but were saved by Joe's mind-over-matter chants. Sora and Joe then arrived slightly late for the final battle with Devimon, but their Digimon were still unable to beat him. Things looked bleak, until Angemon saved the day. Once the kids arrived on Server, then were almost immediately attacked by Etemon, several times. Izzy received a mysterious e-mail from someone Etemon was holding prisoner in his pyramid, who said that he knew where Sora could find her Crest. The prisoner turned out to be Datamon, whom the kids freed - but he turned right around and kidnapped Sora and Biyomon, taking them to another secret chamber in the pyramid. Datamon was in possession of Sora's Crest, and was attempting to create a digital copy of her who could use the Crest, but would be under his control. Tai managed to save her, and Sora snatched her Crest as Etemon stormed in and began fighting with Datamon. Datamon dropped computer viruses into Etemon's Dark Network, turning it into a black hole of sorts, which began sucking in matter. Etemon became bonded to the network, and attacked the kids, but Tai, having mastered true courage in saving Sora, used his Crest to Digivolve Agumon to MetalGreymon, who destroyed Etemon. This opened a rift to the real world, through which Tai and MetalGreymon were sucked. As time moves faster in the DigiWorld, for the few hours that Tai was on Earth, months passed in the DigiWorld, during which time the group fell apart without Tai. Sora and Biyomon wandered off on their own, and ran into DemiDevimon, who was working for Myotismon. He told Sora her Crest would never glow, as she didn't know what love was. Sora attempted to prove that she did know love, and felt it for the other DigiDestined, by following them around, saving Tai and T.K. from the Mushrooms of Forgetfulness, helping to prevent some of the accidents DemiDevimon was causing at the restaurant Joe and Matt and been forced to work in and convincing Mimi to stop being such a spoilt brat when she was in the palace of the Gekomon and Otamamon. Once the kids were all together again, they spotted Sora lurking nearby, and she had to come forward and explain herself. She broke down crying when she revealed that her crest still wasn't glowing - but then, the kids were attacked by Myotismon. Biyomon was determined to fight him, even though it was impossible for her to win, and Sora attempted to stop her. Sora then realised that her refusal to let Biyomon fight stemmed from her love for her - and her Crest began to glow, allowing Biyomon to Digivolve to her Ultimate stage of Garudamon, who held Myotismon off long enough for the kids to escape. Sora and the kids then returned to Earth to stop Myotismon's assault on Odaiba in his search for the Eighth Child, the predestined eighth member of the DigiDestined. The kids were lucky enough to get a ride into town from Sora's cousin, Duane. When Myotismon's armies began to capture the populous of Central Odaiba, Sora was among those captured and held at the city's convention centre. Sora engineered a breakout, using the mind-over-matter chants Joe's showed her to weaken the Bakemon guarding them. When DarkTyrannomon showed up to stop the escape, it was thanks to a distraction perpetrated by her mother and Biyomon that Sora was able to escape, and went on to meet up with the other kids in time to arrange the final attack on Myotismon. After defeating Myotismon's Digivolved form of VenomMyotismon, Sora and the kids returned to the DigiWorld to battle the Dark Masters. After Matt left the team, determined to find his own path in life, rather than just following Tai, Sora stayed with Tai. During the battle with LadyDevimon, Tai dispatched her and T.K. to find Matt, Joe and Mimi. They set out looking for him, but Sora was fearful that they would never find them. Realising the importance of the task before her, she began to doubt her ability, and to fear her own inadequacies. Her negative feelings manifested themselves as a dark energy, which sucked her into a cave, placing her in a trance of despair. Matt and Joe saved her from the darkness, just as Gabumon had saved Matt earlier, by explaining to her that they had to do the right thing, and that together, they were the only ones who could make a difference - it wasn't just all on her shoulders, as she feared it as. Sora was freed, her sprits high, and she, Joe and Matt headed back to the rest of the team. WarGreymon and MetalGarurumon were transformed into key chains as they fought Piedmon, as were the others, one by one. Soon, only Sora, T.K., Kari, Patamon and Gomamon were left. Sora made T.K. promise to run away, to prevent Piedmon from getting them, but then, she too fell to the villain, along with Gomamon. Patamon Digivolved to MagnaAngemon and returned everyone to normal with his MagnaAntidote, and then, Mimi and her Digimon allies showed up, and helped defeat Piedmon and his Vilemon horde. The kids were then pulled into battle with Apocalymon, who destroyed their Crests - but when the kids realised that the power was inside them, and had been all along, they used their Digivices to turn Apocalymon's Total Annihilation attack back on him, destroying him. After they beat Apocalymon, the DigiWorld began reformatting itself, and the kids had to return home. Sora and Biyomon exchanged a tearful goodbye. Eight months later, when Tai gave Sora a hairclip for her birthday, she got angry, thinking it meant he didnt like her hair. She refused to speak to him, and when he tried to apologise by e-mail, the message got lost along the way. As Tai and Izzy became embroiled in conflict with Diaboromon, Sora was apparently totally unaware anything was wrong. Tai left her a message on her answering machine asking her to come over, and she almost did, but turned away outside the Kamiya apartment at the last minute. When Diaboromon was destroyed, Tais e-mail got sent through, and Sora forgave him. In May 2000, Sora and the other DigiDestined were called back into the DigiWorld by Gennai, where they were instructed to release the powers of their Crests, creating a shield which would protect the DigiWorld from the forces of evil. As a side effect of this, Biyomon and the other Digimon lost the ability to Digivolve to their Ultimate forms. Subsequently, she and her father had many discussions about Digimon and the DigiWorld. The years passed, and Sora began to play tennis, her mother teaching her as their relationship continuously improved. Four years after Apocalymon's defeat, when the Digimon Emperor began his takeover of the DigiWorld, Tai called all the older DigiDestined together, to discuss the situation. Sora and Izzy accompanied T.K., Kari and the new DigiDestined  Davis, Yolei and Cody  into the DigiWorld the next day, where they met their Digimon again, but were soon attacked by the Digimon Emperors slaves. Davis and Veemon were captured, and everyone else fled into the forest, where they came across a temple  and inside were the Digi-Eggs of Love and Knowledge. Sora was unable to lift the Digi-Egg of Love, and suggested Yolei try. The girl lifted it with ease, and her partner Digimon, Hawkmon, appeared. Yolei was horrified at the notion of having to fight, but Sora told her how much she reminded her of Mimi, and how she hadnt wanted to fight as well. With this reassurance, Yolei activated her Digi-Egg, and Hawkmon became Halsemon, and he and Digmon freed Davis and Veemon from the Emperors clutches. Sora was next seen very briefly, along with Birdramon, helping to destroy some Control Spires. Some time later, Birdramon was shot down over the desert by Airdramon, and reverted to Biyomon. She came across Starmons town, but was attacked and thrown in jail. Soras Digivice flashed a distress call, and she and the new DigiDestined, sans T.K. and Kari, headed to the DigiWorld to find out what was going on. They found Starmons town, and Starmon himself offered them a glass of welcome milk  before revealing his Dark Ring, turning on them and throwing them into the same cell as Biyomon. Shortly, Deputymon arrived, and freed Sora, Yolei and their Digimon, as he wanted them to play cards with him. Cody and Davis alerted Starmon to this, and then managed to escape as Deputymon and Starmon fought. Starmon defeated Deputymon, but was then blasted by Flamedramon, and crashed into the Control Spire, destroying it and freeing himself. Sora did not appear again until Christmas, when it became obvious that she had developed a rather serious romantic attraction towards Matt. She baked him some cookies as a present before his concert, and was waiting to give them to him with Tai showed up, and casually attempted to ask if she was going to the concert with anyone, quite obviously wanting to ask her to go with him. She said she wasnt, in case Matt was free afterward  it was a tense moment for both of them, but Tai put his own feelings aside, and simply told her to go in and say hi to Matt for him. Matt evidently speedily reciprocated her feelings, because when the concert was invaded by a DarkTyrannomon, he immediately rushed to Soras side, to protect her from falling rubble  much to the dismay of June Motomiya. As Digimon began to appear all over Earth, Sora and the others were called to Izzys apartment, where they set about contacting DigiDestined all across the world. Gennai arrived, and used one of Azulongmons Digi-Cores to energise the original eight Digimon restoring their ability to Digivolve to Ultimate. Then, they all set off to different countries, to round up the wild Digimon there. Sora and Yolei were sent to Russia, where they immediately encountered problems in the form of the language barrier  Gennais Russian counterpart, Ilya, was running late, and they could not communicate with the Russian DigiDestined, Anna, Sonya and Yuri. Yolei came up with an unusual plan to co-ordinate their attack on the swarms of Flymon above Moscow by using Russian food as commands. The Flymon were defeated, and Ilya arrived, taking the girls to Siberia, where they had to fight a herd of Mammothmon. The numbing cold caused Sora to pass out, and she fell off of Garudamon, but was saved by Aquilamon, just as Imperialdramon arrived to dispatch the Mammothmon and save the day. Once they were back in Odaiba, the kids had no time to rest, as the Daemon Corps appeared, searching for Ken and the Dark Spore within him. When Angewomon was battling LadyDevimon, Sora and Matt showed up with Garudamon and WereGarurumon, prompting LadyDevimon to flee. Sora and Garudamon were part of the battle with SkullSatamon, but Biyomon and the other Digimon had to sacrifice their power to Digivolve to Ultimate once again to energise Imperialdramon, allowing him to Mode Change to his Fighter Mode and destroy the villain. Later, Sora and Tai were seen trailing Noriko, one of the children whom Oikawa had implanted a Dark Spore in. Norikos spore had flowered early, and Oikawa had already absorbed its power. As the other kids staked out Highton View Terrace, Izzy asked Matt if he minded Tai and Sora being alone. Matt said he knew how he felt, but Tai was his best friend, and he trusted him. Shortly thereafter, as MaloMyotismon began to spread his darkness across Earth, Sora and her parents, along with the other original DigiDestined, their families, and Noriko and her parents, went to the summer camp where everything had started four years before. There, the gateway to the DigiWorld opened, and Sora  despite her fears that they may not be able to win  took Noriko under her wing, as they all went into the DigiWorld, to face MaloMyotismon. The DigiDestined managed to convince the children implanted with Dark Spores that their lives were not meaningless, and got them to talk about their dreams  this flow of positive energy weakened MaloMyotismon, discorporating his body. Then, everyone used their Digivices, giving Imperialdramon a power boost, enabling him to using his Giga Crusher attack to destroy Myotismons spirit, seemingly once and for all. Three months later, when it was discovered that Diaboromon had survived his battle with Omnimon four years beforehand, Sora was once again absent, at least for most of the conflict, as she was away at a tennis championship. She returned in time to help Tai and Matt pull themselves together after Omnimon was defeated by Armageddemon. Twenty-five years into the future, the gateway to the DigiWorld remains open, and Biyomon is still at Soras side. Sora has become a fashion designer, creating traditional Japanese-style clothing, and is married to Matt  they have two children, a son with a Tsunomon and a daughter with a Yokomon. It was never stated in dialogue that they were married, but its obvious from their children  the boy shown to be Matts son has Soras hair, while the girl shown as Soras daughter has Matts hair. V-Jump magazine later confirmed the marriage. Chronologically speaking, Sora first appears in Digimon: The Movie. She first appears in the series in "And so it begins..." Her voice is supplied by Colleen O'Shaughnessey. The kids finds Sora, who has been unable to make her Crest glow, and are attacked by Myotismon, making his first full appearance, only to be saved when Sora realises her love for Biyomon, allowing her Crest to glow and for Birdramon to Digivolve to Garudamon for the first time. Track 11 on the Digimon: The Movie soundtrack, by Summercamp. It does not play during the movie, but its possible that it was selected for the soundtrack to reflect the situation between Willis and Kokomon  lines such as Now it seems you want to be the person that you used to be, and I dont think youll find the places that you used to be called home, could be construed as being relevant to that. For the lyrics to this song, click HERE. When the Dark Masters conquered the DigiWorld, they reformatted it's digital matter into the massive Spiral Mountain - everything that had existed in the DigiWorld was transplanted onto the mountain, leaving nothing but ruins at it's base. The mountain was effectively split into four areas - the ocean, the forest, the city, and anything else - each of which curled around the mountain in a spiral, giving it it's name. MetalSeadramon controlled the oceans, but was destroyed by WarGreymon, allowing the seas to return to normal. Puppetmon controlled the forests, but when he was destroyed by MetalGarurumon, they too were restored. Machinedramon was in control of the amalgamated city, with a computer network running through it, but when WarGreymon sliced him to pieces, it was returned to it's rightful place. After the DigiDestined defeated Piedmon, the last traces of Spiral Mountain were gone - but then, Apocalymon emerged, and they were forced to battle him. When he was destroyed, the entire DigiWorld began to reformat itself into to normalcy. Davis attempts to convince the others to let Ken join the group, and Yolei must make a decision. Mimi calls the DigiDestined to the DigiWorld, where they have to stop a Golemon from destroying a dam  but the creature cannot be halted. It transpires that it is an unliving Digimon created from a Control Spire by the mysterious woman. Yolei overcomes her reservations surrounding Ken, and Hawkmon Digivolves into Aquilamon for the first time, to help Stingmon destroy the Golemon. 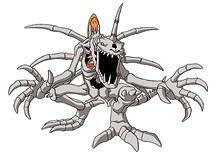 The new DigiDestined encountered Starmon when he fell under the control of one of the Digimon Emperors Dark Rings. Biyomon had been shot down by a squadron of the Emperors Airdramon, and found herself in the desert, where she came across the Wild-West-esque town that Starmon inhabited. He incapacitated her with his Meteor Shower, and locked her in a cell. This occurrence triggered a distress signal on Soras Digivice, and she and the new DigiDestined (sans T.K. and Kari) headed into the DigiWorld to find Biyomon. They too came across Starmons town, where he welcomed them with glasses of milk, but then turned on them when they brought up Biyomon, revealing his Dark Ring and locking them up in the same cell as Biyomon. The girls (and Hawkmon) were subsequently freed by Starmons Dark-Ring-free partner, Deputymon, and wanted them to play cards with him. 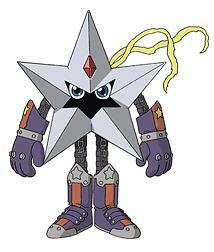 When Starmon found out, he raced off to confront Deputymon in battle, and managed to defeat him with his Meteor Shower. Flamedramon then took Starmon on, and hurled him into the towns water tower, which concealed a Control Spire. It was destroyed, and Starmon was freed. He and Deputymon then invited the kids to play another game of cards before they left. A Starmon was also present during the final battle with MaloMyotismon. Steve is a Jewish American DigiDestined, partnered with a Frigimon. When Digimon were appearing all over the real world, Steve and his Frigimon showed up in Rockafeller Centre to help Davis, Mimi, Michael and the other American DigiDestined subdue an irate Cherrymon. Steve and his Frigimon later reappeared when the Digimon of the world's DigiDestined united against MaloMyotismon. Stingmon is the Digivolved form of Wormmon, the Digimon partner of Ken of the DigiDestined. With thick armour and the ability to project energy spikes from the backs of his hands, Stingmon is as tough as they come! Wormmon first Digivolved to Stingmon when he and Ken were pursuing a mysterious woman through the DigiWorld, after she had materialised in Kens bedroom, and subsequently disappeared. The trail led them to a Punimon village, which was being rebuilt by the new DigiDestined at the time. While working underground, Cody and Digmon were attacked by Thundermon, and Digmon reverted to Armadillomon. When the tunnel collapsed, Armadillomon Digivolved into Ankylomon for the first time, but Cody was swept up in Thundermons destructive wake. As he was hurled through the air, he bumped into Stingmon, who flew him to safety, and then destroyed Thundermon, much to the shock of the kids. Stingmon then reverted to Wormmon, and he and Ken made themselves scarce. Ken and Stingmon were later seen battling a Snimon  another of the mysterious womans agents. It was revealed that the woman was transforming Control Spires into unliving Digimon, as she did so again, making a Golemon, which moved to destroy a dam. After the DigiDestined were defeated trying to stop it, Mimi called on Ken for help, who arrived with Stingmon. When Yolei came to terms with her feelings about Ken, Hawkmon became Aquilamon for the first time, and he and Stingmon destroyed the Golemon. When the reactor of Kens old base threatened to explode, he and Wormmon were alerted to the situation by Davis, and headed for it immediately. When they arrived, the others were already battling an Okuwamon created by the mysterious woman. Davis and ExVeemon convinced Ken and Stingmon that they didnt have to fight alone, and in that moment of unity, Stingmon and ExVeemon DNA Digivolved into Paildramon for the first time! Paildramon defeated the Okuwamon, and destroyed the reactor. When the mysterious woman lured the kids to the Giga House, Stingmon appeared again to battle an army of Roachmon under her control. He and Ken were hurled into the houses giant washing machine by some Kunemon, but were rescued by Submarimon. They then located the mysterious woman, but Stingmon and Digmon then fell under her control, their minds being affected by the music of her flute. ExVeemon managed to hold them off while Davis, Ken and Cody escaped a Dokugumon, then they took refuge in a drawer, which Stingmon and Digmon began to hack through, until Yolei and Kari were able to use the houses computer to undo the effects of the flute. Enraged, the mysterious woman revealed her true identity  Arukenimon, an insect Digimon! Stingmon and Paildramon merged into Paildramon and battled her, but she was saved by her partner, Mummymon. Ken and Stingmon were next seen helping to destroy some Control Spires. Davis and Yolei tricked Ken and Cody into working together, and Stingmon and Digmon destroyed a Spire together, but Ken and Cody were irritated by the deception. Ken left, but when Arukenimon created BlackWarGreymon, Yolei raced to get him, and was forced to slap him to make him come back. Stingmon and ExVeemon became Paildramon again, but they were defeated by BlackWarGreymon, who then turned on Arukenimon. While searching for Gatomons lost tail ring, Ken, Kari and Yolei inadvertently stumbled through a phase warp into the World of Darkness, where their Digimon were unable to Digivolve. After Arukenimon turned some Control Spires into a Blossomon, the portal back to the DigiWorld opened, and Wormmon and Hawkmon Digivolved into Stingmon and Aquilamon to fight it. They were defeated, but then Gatomon and Aquilamon DNA Digivolved into Silphymon and defeated the Blossomon. When Arukenimon and Mummymon turned their attention to the first Destiny Stone, the kids tried to stop them, but were restrained. Stingmon and Ken arrived to free them, and then Paildramon and Silphymon battled them, but BlackWarGreymon appeared and destroyed the stone. When the second Destiny Stone was then destroyed, it created a warp in reality, which caused some Digimon to appear in the city of Kyoto on Earth, where Yolei was on a class trip. Ken and Stingmon hopped through the DigiWorld to get there quickly, where Stingmon took down an Apemon, and took him back to the DigiWorld, where he then joined in an already-ongoing battle with Arukenimon and Mummymon, becoming Paildramon with ExVeemon again. In the following battles to protect the Destiny Stones, Stingmon repeatedly merged with ExVeemon into Paildramon, to be defeated by BlackWarGreymon, who eventually managed to destroy six of the seven stones. The search for the final stone lead everyone to a Chinatown area of the DigiWorld, but Ken was later in arriving. There was a brief clash with Arukenimon and Mummymon, but they left to pursue Digitamamon and Tapirmon. Ken and Stingmon showed up, and the DigiDestined and Digimon sat down to eat before going after the villains, who had discovered the final stone. Stingmon and ExVeemon became Paildramon, and, with Silphymon and Shakkoumon, battled to protect the stone. When Arukenimon brought a Control Spire to Earth at Christmas, the Armour Digimon had to destroy it first, and then Wormmon became Stingmon and merged with ExVeemon again to help round up the wild Digimon who had appeared with the Spire. The next day, the scenario repeated itself, as Wormmon was unable to Digivolve to fight a Triceramon. Davis arrived with Raidramon and destroyed the Spire in the area, and then he became ExVeemon, to merge with Stingmon and battle the Triceramon. When Mummymon joined the fight, Paildramon was energised by light from Azulongmons Digi-Core, and became Imperialdramon, hurling Triceramon through the Digi-Port and sending Mummymon fleeing. When everyone returned to Tokyo, they found they had no time to rest, as the Daemon Corps arrived, searching for Ken and the Dark Spore within him. 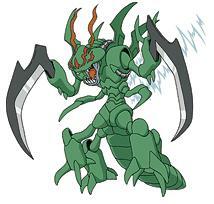 Stingmon merged with ExVeemon into Paildramon, and became Imperialdramon to battle SkullSatamon, but could not defeat him until everyone gave their energy to him, allowing him to Mode Change to his Fighter Mode to destroy the villain. Ken was then spirited away by Arukenimon, and Davis and Wormmon gave chase on Raidramon. As Oikawa, Arukenimons boss, prepared to hand Ken over to Daemon  no longer having a use for him as he had already copied Kens Dark Spore and implanted it in other children  Veemon and Wormmon intervened and freed Ken. They became Stingmon and ExVeemon again, and Digivolved up to Imperialdramon Fighter Mode to battle Daemon. Ken opened a gateway to the World of Darkness, through which Daemon was sent. While WarGreymon battled BlackWarGreymon to prevent him from destroying Oikawa, Stingmon and ExVeemon directed traffic away from the battlefield, but merged into Paildramon to prevent Oikawa from getting away. Then, when the battle between the two WarGreymons spread into a nearby town, they had to let him go, and became Imperialdramon Fighter Mode to end the fight. They later combined into Paildramon again when the Dark Spore of the girl named Noriko bloomed prematurely. When they were in the dream dimension of MaloMyotismon, the kids were able to use that worlds power to make all their Digimon Digivolve into their separate forms at once. Wormmon, Stingmon, Paildramon and the two versions of Imperialdramon joined with the others in battling MaloMyotismon, but when the villain fled into the DigiWorld, only the real incarnation of Wormmon could follow, and so Imperialdramon Fighter Mode passed through the portal, while the Stingmon avatar faded away. 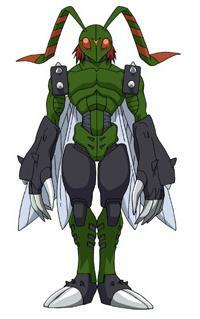 Three months later, during the battle with Armageddemon, Wormmon quickly Digivolved into Stingmon, then merged with ExVeemon to form Paildramon, then Imperialdramon. Stingmon first appears in If I had a Tail Hammer. He doesnt get a Digimon Analyser screen until the following episode, Spirit Needle, we dont get to see his Digivolving sequence until the episode after that, United We Stand. His voice is supplied by Paul St. Peter. The hunt for the final Destiny Stone leads Arukenimon, Mummymon and the DigiDestined to a Chinatown area of the DigiWorld. A fight is avoided when Arukenimon and Mummymon pursue Digitamamon and Tapirmon into the forest nearby to learn the recipe for the noodle soup they ate at his restaurant  where they discover the secret: a natural spring transformed into soup by the final Destiny Stone! The DigiDestined and BlackWarGreymon arrive on the scene, and Angemon and Ankylomon DNA Digivolve into Shakkoumon for the first time to join in the battle against the villains. Episode Trivia  the title of this episode is based on the fairy tale of the same name, where a village comes together to make soup to feed them all. While in pursuit of MetalGreymon and the Digimon Emperor, the new DigiDestined, along with Matt and Tai, come across the Digi-Egg of Friendship. No one is able to lift it, and then, they are attacked by MetalGreymon, as a Flymon captures Patamon for the Emperor, who attempts to put a Dark Spiral on him. Garurumon arrives to save Patamon, and then Davis manages to overcome his fear of hurting MetalGreymon, causing the Digi-Egg of Friendship to active. With it, Veemon becomes Raidramon and frees MetalGreymon from the Dark Spiral. Episode Trivia: This episode features the first appearance of Raidramon, but one day before it aired, Digimon: The Movie, which also featured Raidramon, was released in theatres. Track 17 on the Digimon: The Movie soundtrack (hidden track number 5), by Jasan Radford. It plays during Terriermons battle with Kokomon in the opening portion of the third part of the movie. It is also used as a battle theme during Digimon Adventure 02, making its debut in Iron Vegiemon. For the lyrics to this song, click HERE. After being split up from the others by Devimon, Tai and Agumon run into Frigimon, and then save Matt and Gabumon from Mojyamon. Submarimons first appearance was nothing if not timely, as the kids were trapped in an underwater oil platform at the time. While searching for the sixth Digi-Egg, a MegaSeadramon under the control of the Digimon Emperor had trapped them there, with their air supply dwindling. Cody managed to escape  or rather, was forced by everyone else to escape  in a submersible, and called on Joe for help. While this went on, the other kids found the new Digi-Egg  the Digi-Egg of Reliability  and soon, Cody and Joe arrived with reinforcements. As Ikkakumon held off MegaSeadramon, Whamon broke his way into the platform to take everyone to safety. Cody refused to take the Digi-Egg of Reliability, thinking that he wasnt worthy of it, as he had had to tell a lie to get Joe out of his exam so he could come to help. Joe convinced him that he had done the right thing, and Cody activated the Digi-Egg. Armadillomon became Submarimon for the first time, and with Cody in his cockpit, he and Ikkakumon destroyed the Dark Spiral on MegaSeadramon, freeing him. Afterwards, Submarimon took Cody down into the depths to show him the oceans beauty and help him overcome his fear of the sea. Later, when the DigiDestined were on the trail of the Digimon Emperors base, Cody and Submarimon were searching underwater, and hit the jackpot, discovering the Emperors base, as it headed towards the Dark Whirlpool. They snuck inside, and Submarimon reverted to Armadillomon, then became Digmon to free the prisoners there. Submarimon next appeared in the Giga House. Ken and Stingmon had been hurled into the houses giant washing machine by Kunemon, and Armadillomon quickly became Submarimon to burrow through the machines wall and save them. After several failed attempts to protect the Destiny Stones from BlackWarGreymon, the kids located the sixth stone, underwater. Ikkakumon was called in to help, and he brought MegaSeadramon and a shoal of Dolphmon with him. Armadillomon Armour Digivolved to Submarimon to dive in and help, but even with their combined power, they couldnt stop BlackWarGreymon who parted the waters and destroyed the stone. When wild Digimon began to appear all over Earth, Cody, Joe, Armadillomon and Gomamon headed for Australia, to round up the Digimon there. After chasing off a Gesomon, a Shellmon and an Ebidramon, the group  along with Derek, an Australian DigiDestined boy, and his partner Crabmon  were attacked by a Scorpiomon. Armadillomon became Submarimon (in a sequence which said Warp-Digivolve instead of Armour Digivolve, and had Submarimon forget to say his tag-line), and helped Zudomon and Coelamon defeat the Scorpiomon, to be sent back to the DigiWorld. When everyone returned to Tokyo, they had no time to rest, as the Daemon Corps arrived, searching for Ken and the Dark Spore within him. 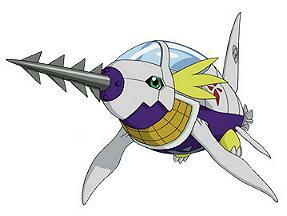 MarineDevimon menaced a cruise ship, and Armadillomon became Submarimon to battle him, along with Angemon. Ikkakumon also showed up and Digivolved to Zudomon, helping to see him off as Joe, Cody and T.K. rescued the ships passengers. When the kids were in MaloMyotismons dream dimension, after defeating illusions of their greatest desires, they were able to use the power of the dimension to their own ends, making their Digimon Digivolve to all their forms at once. Submarimon, along with Armadillomon, Digmon, Ankylomon and Shakkoumon, joined with the other Digimon in battling the villain, but when he fled into the DigiWorld, only the real incarnation of Armadillomon could follow, and so Shakkoumon passed through the portal, while the Submarimon avatar faded away. Submarimon first appears in 20,000 Digi-Leagues Under the Sea. His voice is supplied by Tom Fahn  it starts out very soft in his first appearance or two, but after that, gradually gets deeper, until it is eventually identical to Digmons voice. Sukamon and Chuumon are two bumbling Digimon who live in the forests of File Island, and share one brain between the two of them. Mimi and Palmon first met them when the kids had been split up by Devimon, and they attempted to charge her a toll to pass through the forest. She refused, and when they got nasty, her DigiVice flashed into life, blasting them with light - and suddenly, they were the nicest guys in the world! Both developing crushes on Mimi, they led her and Palmon to Izzy and Tentomon, who were in a temple elsewhere in the forest. When they saw them again a little later, they wanted to be blown a kiss, but Mimi and Palmon returned by pulling faces at them. Sukamon next appeared as part of the small (and inept) force organised by DemiDevimon to be trained by Nanimon so they could be part of Myotismon's army, and help him in his attack on Earth, to search for the Eighth Child (the predestined eighth member of the DigiDestined). Nanimon's brutal training regimen soon had Sukamon (and Chuumon, who was with him), and everyone else, tired and hungry, but Nanimon refused to feed them. Agumon and Palmon had snuck into the castle, using the aliases of PunkAgumon and ReggaePalmon, and Sukamon explained to them that he had been a soldier with Nanimon some time before, and knew his weakness - soda. The bubbles would go straight to his head and make him tipsy (Note - it was alcohol in the Japanese version, which remains painfully obvious in the translation). One of the Numemon in the group scuttled off and found the kitchen, dropping bottles of drinks down to Nanimon, who soon became inebriated, allowing everyone to escape, and for the DigiDestined to get into the castle. Sukamon and Chuumon then returned to File Island, where they did what they usually did - ate. But then, when the Dark Masters began their conquest of the DigiWorld, Sukamon and Chuumon were caught in an earthquake, and Sukamon fell into a chasm that opened up, dying. Chuumon met up with the DigiDestined a little later, and sacrificed himself to save Mimi from Piedmon. After the defeats of the Dark Masters and Apocalymon, the DigiWorld began to reformat itself to normalcy, and a hail of Digi-Eggs rained down on Primary Village, as all the Digimon who had died were reborn - including Sukamon and Chuumon. Four years later, after the new DigiDestined encountered Michael, Gorillamon and Digitamamon, the reborn Sukamon and Chuumon popped up to try their luck again, and asked Mimi on a data. She responded by punching them clean across the lake. Later, when wild Digimon were appearing all over the world, a Sukamon and Chuumon were seen in New York. Whether or not they were the same Sukamon and Chuumon is unknown, but with Mimi in the city, its very likely. The Syakomon are the Digimon partners of the Poi Brothers, the three Chinese DigiDestined boys. 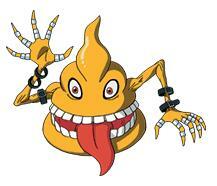 When Digimon were appearing all over Earth, the Poi Brothers and their Syakomon engaged a wild Mojyamon in battle. The Syakomon all Digivolved into Octomon, and took down the Mojyamon with their Spurting Ink technique, but Kari and Izzy arrived to stop them from destroying him. After some initial communication problems, Kari, Izzy and the Pois were ready to work together. The eldest Poy Brother and his Syakomon went with them to the China/India border, where the Syakomon became Octomon again, and used his Spurting Ink technique to write a message to the Chinese army, allowing Mina, an Indian DigiDestined girl, to cross the border with the Digimon she had rounded up. The Pois and their Syakomon appeared again when MaloMyotismon was attempting to infect Earth with darkness. Name: A corruption of their Japanese name, "Shakomon," which comes from "shako," a general term for the type of mollusc Syakomon's design is based on.